Security expert Abloy UK is excited the announce the launch of the world’s first intelligent motor locks – the EL495 and EL595. These innovative and compliant high quality motor locks have been developed to make facilities and sites more safe and secure. The locks automatically diagnose the condition of its capacitors, so when the lock reaches the end of its lifecycle it gives an audible warning allowing the lock to be replaced before it fails. This feature will allow the smoother running of facilities management and provide peace of mind knowing that the lock is operating to specification. Both solutions are compliant to British Standards – EL495 is BS EN179 and BS EN1125 approved, and the EL595 is BS EN179 approved. There are three variants of the EL495 and EL595 available, including a Fail Unlocked (FU) model, Fail Locked model (FL) and high security lock case with mechanical exit feature. The Fail Unlocked (FU) model is designed for high security two-way Access Control doors. In normal operation the inside handle does not operate the lock, access control is required on both sides of the door to allow entrance or exit. The inside handle is electrically controlled, on activation of a fire alarm or other input the handle becomes operational. The deadlocking latch remains locked and the door secure. The Fail Locked model (FL) is for exceptional environments and in normal operation the inside handle does not operate the lock, access control is required on both sides of the door to allow entrance or exit. The inside handle is electrically controlled allowing the handle to be operational when required, on activation of a fire alarm or other input the handle will not allow egress. The latch remains locked and the door secure. 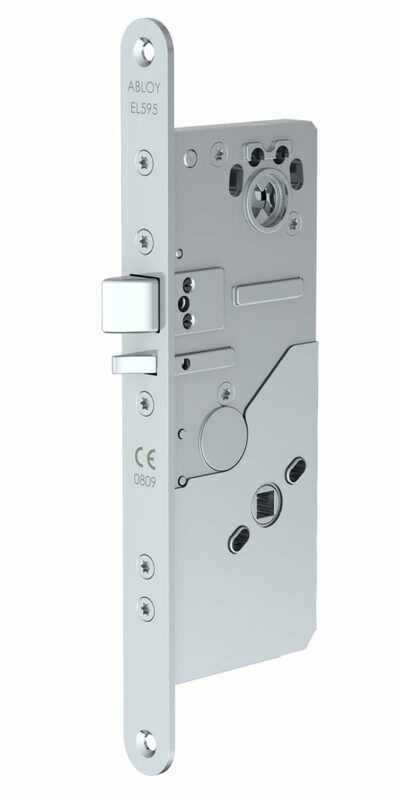 The high security lock case features a mechanical exit feature, and in normal operation the lock is used with access control from outside and the handle on the inside always operational. There is no electronic handle control or diagnostics feature; the EL495 is for profile doors and EL595 is for solid doors. Pat Jefferies, Commercial Director of Abloy UK said: “Abloy’s commitment to quality includes proactive and efficient product development to ensure a streamlined portfolio that meets the needs of our customers. The EL495 and EL595 have replaced previous models EL490 and EL590 which were discontinued at the end of 2018. For information on all products and services available from Abloy UK and Academy courses, visit www.abloy.co.uk, call 01902 364 500, or email info@abloy.co.uk.